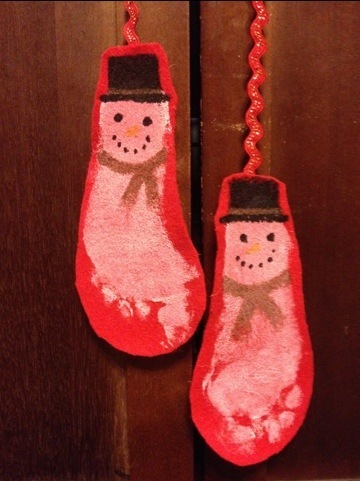 I made these snowman decorations out of felt. 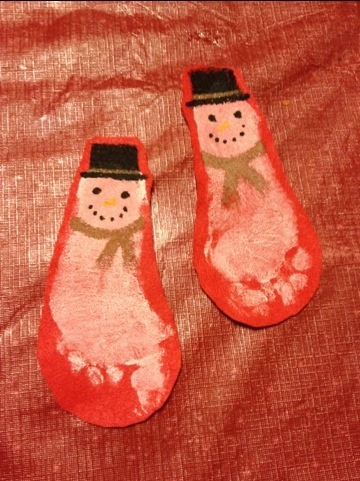 I had my son dip his feet in white acrylic paint and then step onto the felt. Once the paint was dry I painted on the snowman hat, scarf and face using acrylic paints. I cut the snowmen out and then glued a piece of ribbon to the backs with a hot glue gun. 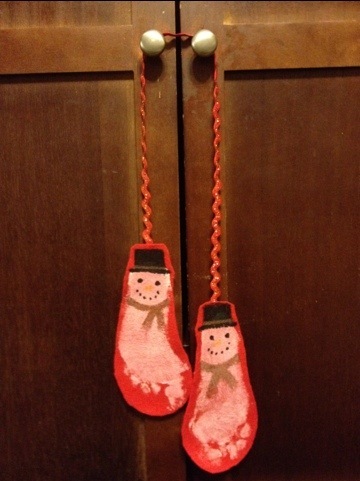 They turned out so cute and he loves seeing his snowman feet hanging on a door or cabinet. Slice your orange very thin, with the skin on. Then chop the orange slices into small pieces. Place all your ingredients in a saucepan on the stove. Cook on high until it comes to a bowl then reduce your heat and cover. 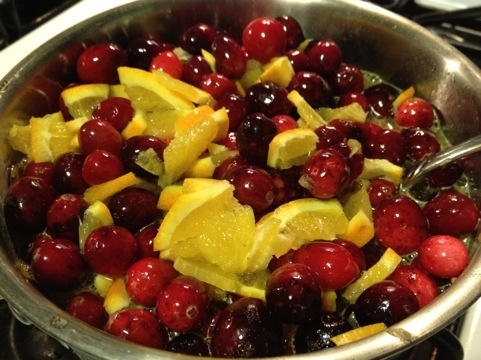 You can let your cranberries simmer on the stove for up to an hour. Let the cranberries cool before placing them in the fridge. Serve chilled. This we would be great as a side all by itself or served heated and served over warm Brie. My kids love grilled cheese and so do I. Sometimes I want to make mine a little more grown up but I don’t want to do any extra work. 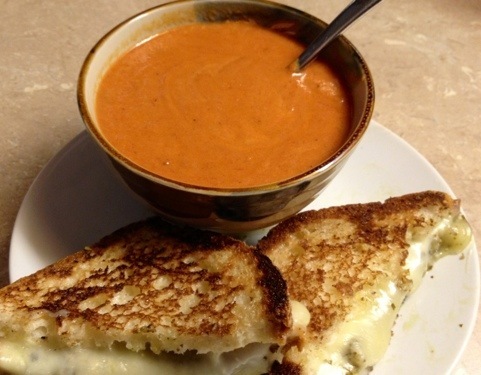 Tonight I made tomato basil soup and grilled cheese with pesto. It was so delicious. For the tomato basil soup all you need is two ingredients a jar of pasta sauce and one cup of milk. I used Newmans Own tomato basil pasta sauce. 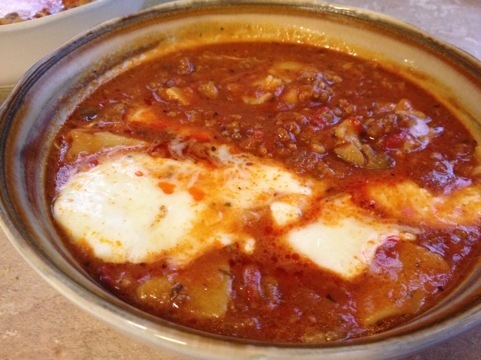 Heat your sauce and milk in a sauce pan and serve. I came across this recipe when I was looking for a way to use up the dozens of jars of sauce we have stacking up in the basement. My husband works for a company that makes all different store and name brand pasta sauces. I was a little skeptical at first but pasta sauce really does make excellent tomato soup. For the pesto grilled cheese I use jarred pesto from Progresso. I love pesto but it doesn’t make sense to make it myself in the winter when there’s no basil growing in my garden and honestly the jarred stuff is pretty darn good. The only difference from making this and a regular grilled cheese is that you spread pesto on one half of your sandwich before you grill it. 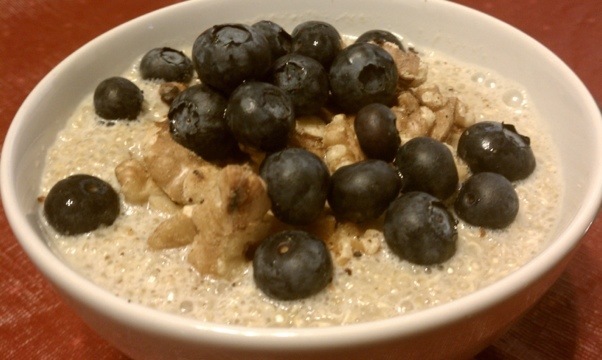 This is a great, quick and satisfying work night meal. The best part is that the kids can have their grilled cheese and I can have mine (on gluten free bread of course). My kids love drinking yogurt. It makes a great on the go meal or snack for them. But drinking yogurt is expensive. Here’s what I do to save money and make it an even easier portable snack. I buy regular yogurt by the tub. I spoon the yogurt into sippy cups or water bottles. Then I shake it. That’s it. The more you shake it the thinner it gets. My kids love it and I know that they’re getting a healthy snack. 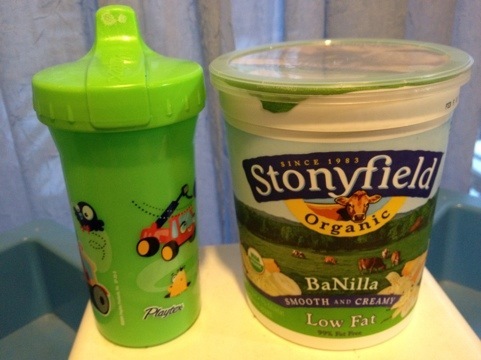 I buy Stoneyfield farms whole milk yogurt for my one year old because kids under the age of two need more fat in their diet for healthy brain development. For My 3 year old I give him the Banilla (Banana and Vanilla), it’s his favorite. I love making soup. I especially love how soup can clear out a fridge of leftovers. The only thing I had to buy for this lasagna soup recipe was the chicken stock. Everything else I had in my cupboards and fridge already. I based this recipe on Paula Dean’s “Tastes like Lasagna Soup” but like most recipes I made it my own. Number one there were too many ingredients in it. I don’t want to go to the store and buy a whole bunch of extra ingredients I want recipes that are simple and easy to make. Number two I wanted to use what I had in the house. So I encourage you to use what you’ve got have fun with it. Really you could put anything in this soup that you would find in lasagna. For a veggie version just leave out the meat and add more veggies. It really is just that easy. Some of my changes I think made the soup even better. For one I had an open jar of roasted red peppers in the fridge. These made my soup so much more flavorful and delicious than using chopped bell peppers. I also, for health reasons, make all my recipes gluten free. For this recipe there are two important ingredients that needed to be changed in order for it to be gluten free the pasta of course and the chicken broth. For my recipe you will need. I started out by sautéing my onions and garlic together and then added the meat to brown. I did this because sautéing really sweetens the onions and I wanted those onion and garlic flavors to really marry with the meat. Also because I was using some sausage and some ground beef I wanted those to be well mixed together. Once my meat was browned I added the pasta sauce, the stock, the mushrooms and the peppers. I then let all the ingredients stew together in the pot for a few hours. I added the pasta and let that cook for another hour and then added the cheese at the end and gave it just enough time to melt on the top. This soup was so delicious. It really cleared out my fridge of leftovers and I can’t wait to make it again. After making handprints on felt for me to use on our Christmas tree skirt my three year old asked me if he could do foot prints too. “Sure why not” I said. He loved how squishy and tickly the paint felt on his feet. We did one foot, cleaned it off and then did the other. I decided to make his footprints into little snowmen so I cut them out of the felt then painted on the snowmen’s face, hat and scarf. So fun and easy. Great for a snowy day project. Just glue a ribbon to the back to make an ornament. You could attach them together like mittens on s string. You could even glue them together back to back to make a double sided ornament or hang them in a window. 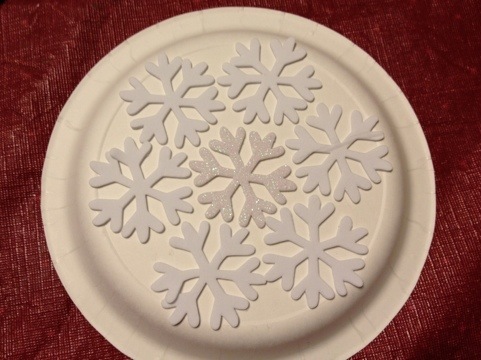 You could make a winter scene to glue them onto or even attach them to a Christmas stocking. Have fun with it. These turned out so cute I might have to try and get his baby brothers footprints too. This year my husband and I decided to celebrate New Years right. We waited until the kids went to bed and then made a special dinner with shrimp cocktail and a salad made with fresh scallops. I pan seared my scallops in butter. Normally I would cook them on each side for about three minutes. These were gigantic scallops so I cooked them a little bit longer. If your unsure if your scallops are cooked all the way you can cut one in half and check that the color is even all the way through. 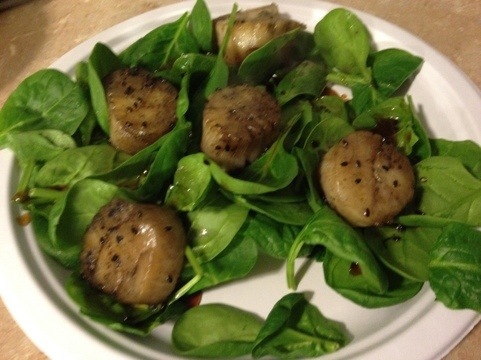 I laid my scallops on a bed of spinach and then poured my dressing over everything. The salad was delicious and a great way to help celebrate the New Year! This year I made a new skirt for our Christmas tree. 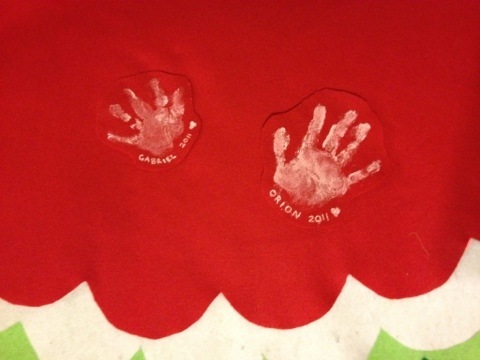 I decided to make it a treasured heirloom by adding our children’s handprints every year. I used acrylic paint. 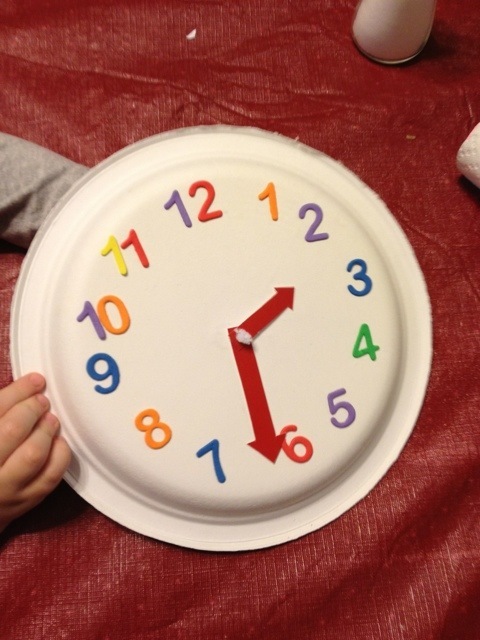 I poured a small amount of paint on a paper plate and had my kids smear their hands in the paint. I actually used a separate piece of felt for them to put their handprints on and attached it to the skirt. 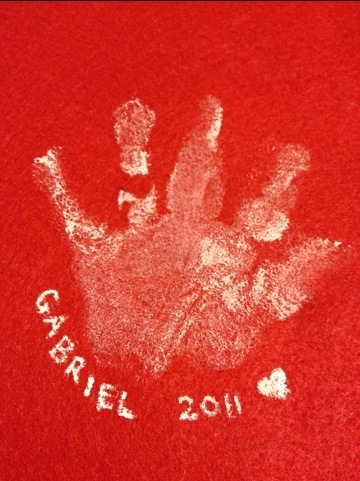 You can use fabric glue or stitch the handprints on. 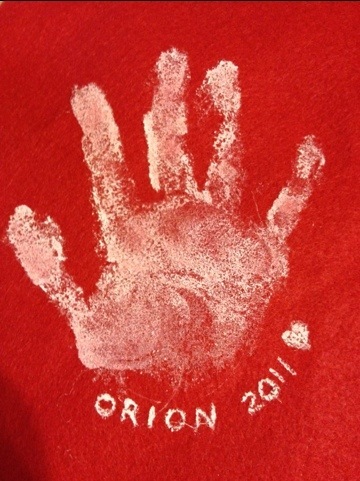 I painted the kids names and the year next to their hands. 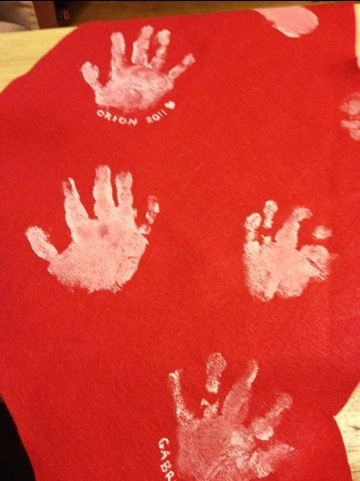 While their hands were all painty I had them do two handprints so that I can keep one in their baby books. On the second set of prints I cut them out and wrote their names on the back with permanent marker and the year.